The other day I bought yet another WordPress book (I have a few!). I was really looking forward to the release of this one though because I had met one of the co-authors previously. He had whetted my appetite for all things WordPress when he gave me a quick run down of what I could expect in the book when it was released. Of course, once it was released I immediately purchased and devoured the book in one sitting (same thing I do with chocolate!). I just knew once I had read the book that I had to share the gist of it with you as well. 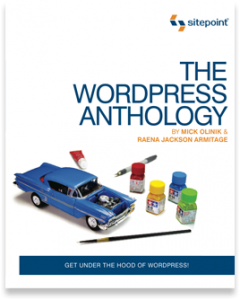 The WordPress Anthology is not a “how to” WordPress book per se but focuses more on the how and why. The book was created to give a University course, if you like, on the basics of WordPress, more intermediate topics and then advanced topics for those of us who yearn to develop WordPress plugins in the future. What I really liked about the book was that it takes you through a journey of understanding the basics of WordPress to setting the stage where you can learn to develop your own plugins (and what essential things you need to consider if you are doing that). One of the strengths of the book is the examples that are interspersed throughout the book. You aren’t left scratching your head and trying to figure out the geek speak as it is all set out for you. For example, one of the chapters delves into the ins and outs of a plugin. You can see a real live plugin (that you can download from the repository) and dissect it to replicate the results yourself. the fun stuff where design and functionality meets – plugins, themes and APIs! One of the authors of the book is Mick Olinik who is not only a super nice guy but also a WordPress developer. Mick is blessed with the unusual ability to be talented with both design and code (an unusual combination in my experience). This gives the book a lot more depth than a typical techie book and Mick really makes you think about Design and Functionality in the book. One of the best parts of the book is that it is full of live examples so you can follow along at your own pace while terminology is dissected. Earlier in the week I caught up with Mick on Skype to discuss the new book and geek out in general over WordPress.